Enjoying the diversity while hiking through a primary rainforest, sighting groups of monkeys and many other animals along the trail. Rewarding out bodies with a soak in the Papallacta hot springs after a challenging climb. Nothing from Wed, 24 Apr 2019 to Thu, 23 Apr 2020. Sumaco (3,826 m/12,552 ft) is a rather isolated volcano rising out of the Amazon rainforest, 50 km east of the Andean Mountain Range. It is estimated that Sumaco last erupted sometime between 1865 and 1925, however its extremely isolated position prevented it from being noticed and recorded. An interesting fact regarding its geology is that a geochemical researcher from Columbia University has identified the volcanic rock of Sumaco as being distinct from the other cones of Ecuador. This indicates that the lava in Sumaco has a different origin than the other Ecuadorian peaks. The volcano is inside the Sumaco Galeras National Park. The Park was created in 1994, and represents 8% of the Ecuadorian Amazon or 200,000 hectares (500,000 acres). The Sumaco Galeras National Park is located 100 km south-east of Quito in western Napo province. 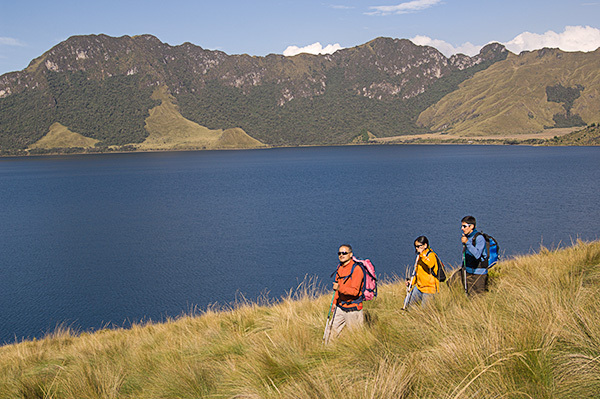 Sumaco is surrounded by untouched primary forest ranging from tropical amazon plains, to Andean cloud forest, on up to páramo grasslands. Here in the transition zone between the Amazon and the Andes there has evolved the richest biota in the world, it is a hotspot of biodiversity. In fact, the Park contains the highest number of bird species in the world- 831 species all packed into 66 square miles! This is a higher bird diversity than Costa Rica or all of the United States and Canada combined. While hiking through this untouched jungle forest, it is common to see groups of monkeys and many other animals. 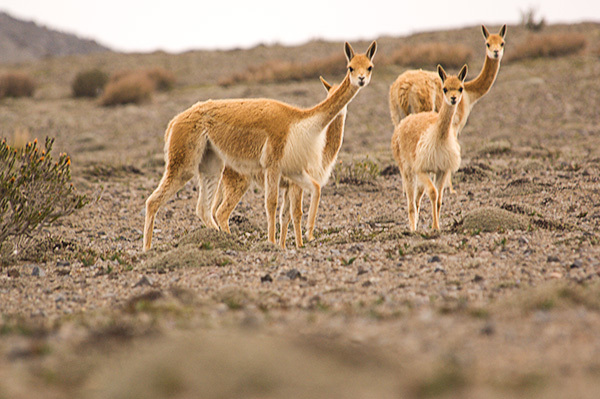 Since there is no history of human exploitation in this area, such as hunting, the animals do not typically shy from human contact. Jaguars, puma, spectacled bears, giant anteaters, mountain and lowland tapirs, several species of monkeys, birds, bats amphibians and reptiles all coexist in the same small area. 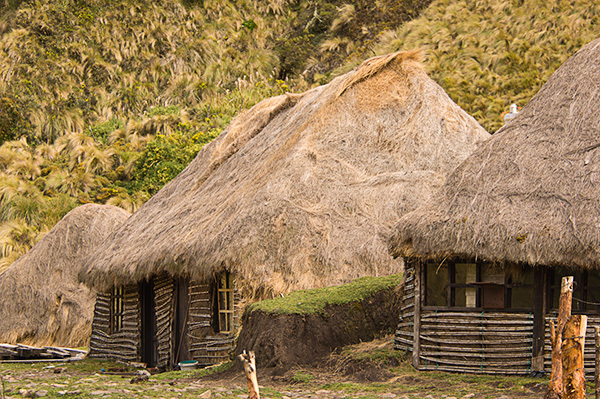 The community of Pacto Sumaco is the only point of access to the Sumaco volcano. 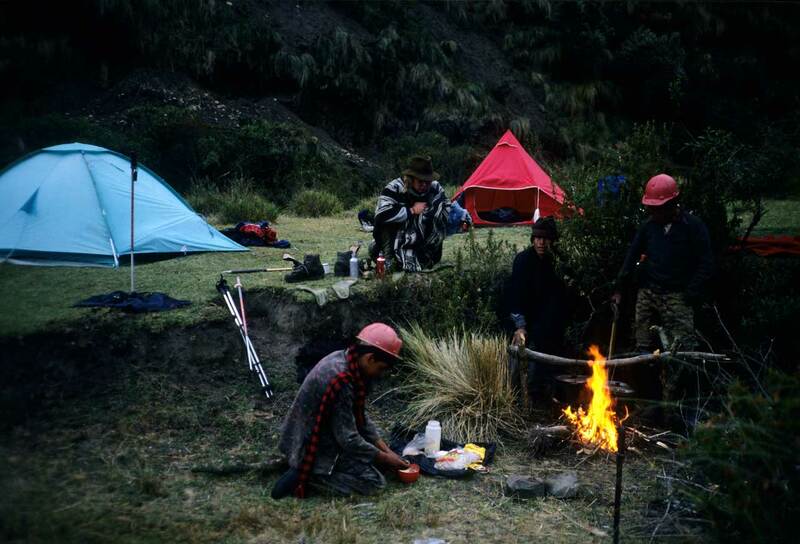 In 1998, the residents initiated an ecotourism enterprise with the goals of: (1) diversifying the sources of income for both indigenous and non-indigenous inhabitants, (2) promoting the sustainable use of the local natural and cultural resources, and (3) through responsible tourism preserving and protecting the high biodiversity of the region. The United Nations Education, Science, and Culture Organization, UNESCO, acknowledged the great cultural and natural value of the Sumaco Galeras National Park by declaring the Sumaco region a World Biosphere Reserve in 2000. So on this trip, not only will you enjoy a truly beautiful area, you will be supporting local sustainability efforts. 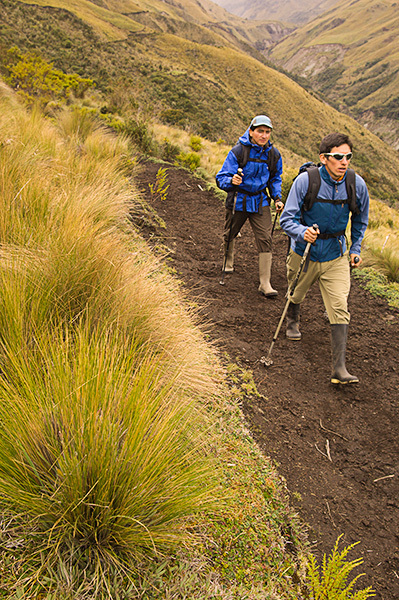 One of the many highlights of this rainforest trek is reaching the summit of Sumaco. From the top of the rim, we will be able gaze down into the extinct crater. Looking out to the west, you can take in the view of the surrounding snow-capped peaks of Cayambe, Antisana, and Cotopaxi far in the distance. To the south and east, the Amazon basin stretches as far as the eye can see. And we will be able to watch Reventador’s usual volcanic activity from afar. 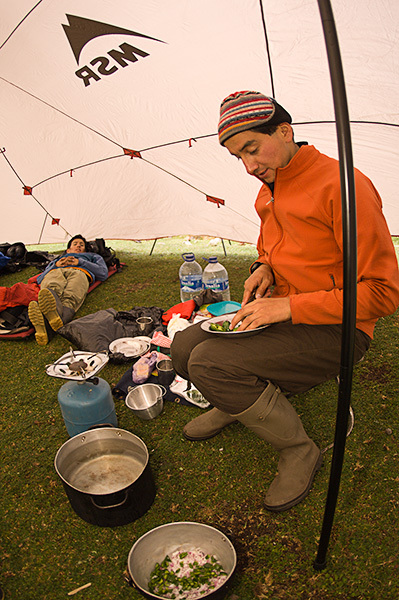 It is a tough 4-day hiking excursion which requires very good physical condition and a tough attitude as rainy conditions more often than not prevail. After our trek out of the rainforest, we will spend a day at the Termas de Papallacta Spa & Resort as a reward after a challenging climb. Papallacta has a plethora of spring fed thermal pools- right outside the door of each room and a large complex with a series of hot pools of varying temperatures. There are also opportunities for indulging in a massage or aromatherapy treatment. At 8:00 a.m. we drive four and a half hours from Quito to the community of Pacto Sumaco. From here we begin our hike. 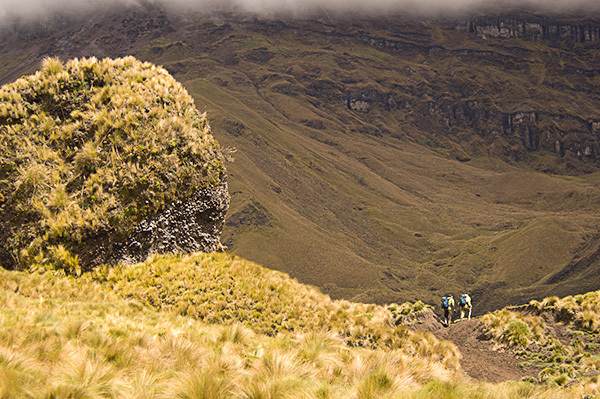 We will hike over a well maintained log trail for the first hour, then the final three we travel through the primary forest over gently rolling hills along a winding trail to the hut at El Mirador (1,700 m/5,577 ft) near a small river. After breakfast, we begin hiking through the Bosque de Monos (Forest of Monkeys) which, as the name implies, is loaded with wildlife. After 4 hours of hiking we reach our destination, Guagua Sumaco Hut 2,500 m/8,202 ft), located near a lagoon with the same name. 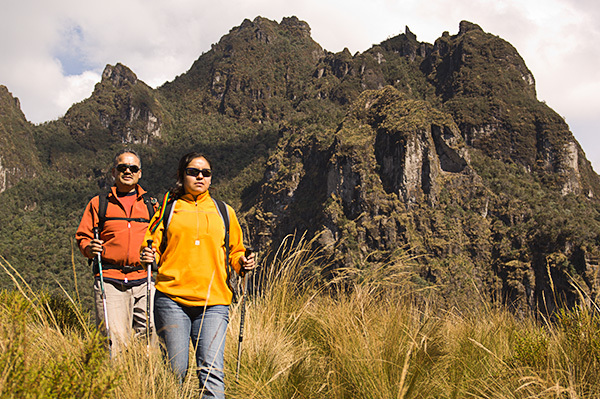 Here we will enjoy great views of Gran Sumaco. Today we hike four hours through bamboo forests to the Pava Yacu Hut 2,800 m/9,186 ft at the base of Sumaco. We will prepare for tomorrow’s climb then turn in for the night. Today we summit Sumaco. We travel an hour through forests, crossing the last creeks to arrive at the end of the tree line. After another two to three hours we will reach the summit where we will have lunch and enjoy the view overlooking the Amazon basin. Then hike back to the hut. 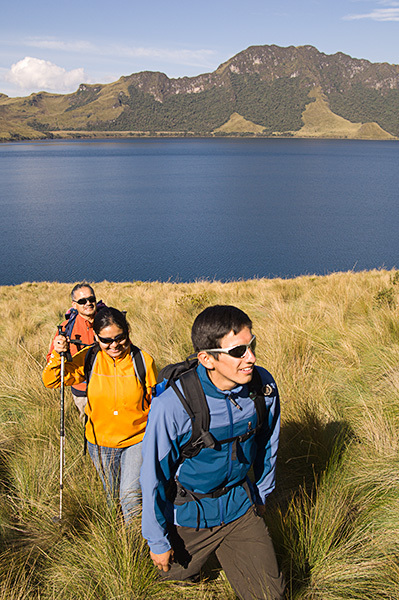 Hike to El Mirador, stopping for lunch at the Guagua Sumaco Lake, which will take 5 hours. Today we hike four hours to Pacto Sumaco to meet our transportation. After loading our equipment we drive to the Papallacta Spa and Resort to treat ourselves to hot showers and a soak in their thermal pools. You can treat yourself to a therapeutic massage in the morning and take a last dip in the thermal pools. Then we drive back to Quito in the evening.